450 surgical questions for undergraduates with not only the correct answers, but the full rationale for finding the answer in each case - invaluable not only for self-testing before an exam, but of value throughout a student's surgical studies, through to finals exams and beyond. Single Best Answers in Surgery offers a new approach to revising for surgical finals; by not only indicating the correct answer to each question, but explaining the full rationale used for finding the answer in each case. This means the book is invaluable not only for self-testing before an exam, but will have long-term value throughout a student's surgical studies, through to finals exams and beyond. The questions are arranged into topic areas, followed by a practice exam for true self-assessment. 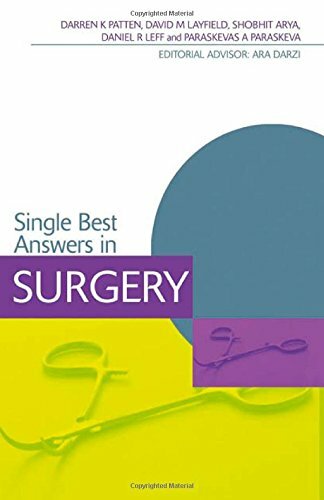 Single Best Answers in Surgery contains 450 questions and answers in the following areas: (1) Pre- and Postoperative Management, (2) Fluid Balance and Parenteral Nutrition, (3) Trauma, (4) Abdomen: Upper GI and Hepatobiliary Surgery, (5) Abdomen: Lower GI Surgery (6) Abdomen: The Acute Abdomen, (7) Breast Surgery, (8) Vascular Surgery, (9) Urology, (10) Orthopaedics, (11) Neurosurgery, (12) ENT Surgery, (13) Ophthalmic Surgery, (14) Lumps, Bumps, Skin and Hernias, (15) Practice exam Produced by an excellent team of authors and with an introduction by Editorial Advisor Professor Sir Ara Darzi KBE.